If you want to feed a crowd, the Expandable thermal carrier is just for you! the ultimate in hot and cold food transport, this insulated carrier has a large main compartment and an Expandable top compartment that are designed to accommodate most 9″ x 13″ baking dishes. Both compartments feature SuperFoam insulation plus Therma-Flect Radiant barrier to keep food hot or cold for hours and an Ultra safe leak proof, easy clean lining with Microban to protect against bacterial odors and stains. Included with the carrier is a dish holder/trivet that allows you to take hot food straight out of the oven and place it inside the carrier. 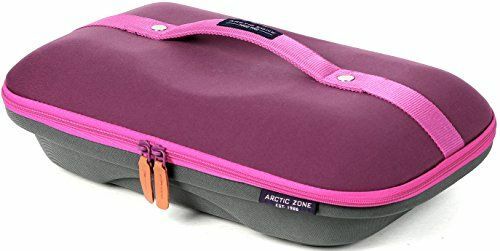 The exterior has a large zippered pocket that is great for carrying accessories like cutlery, napkins or BBQ tongs and two handles with snap closure. Great for holidays, parties, potlucks, picnics and more.